AMMONNEWS - By By William Mullally - In one horrifying day in 2005, Malek Akkad lost both his sister Rima and his father, the legendary filmmaker Moustapha Akkad. Though his father had already had a long and accomplished career, this is not where the story ends. In 1976, Moustapha Akkad made a film so bold, it was banned in many countries, caused protests across the world, and was kicked out of the country in which it was being filmed, only to become so beloved and successful it is now seen as one of the pillars of Arab cinema. In many homes in the Middle East, it has become something passed down from one generation to the next, a film that had educated and enlightened millions. That film is The Message. Though Akkad went on to have a long career as a director and producer, it was this film that traced the early days of Islam that shook the world, and continues to resonate today. After the heartbreaking attacks in Amman, what worried his son Malek was whether the shocking way in which he died would overshadow the courageous way in which he lived. “Many people know about the tragic ending that my father and my sister faced, and I didn’t want that to be the most known or thought of part of his life. He lived the life of five men. He realized all of his dreams and he did such amazing, wonderful work. No man’s journey should be remembered by how it ends. We all face our endings one day, but it’s really about what you do with life. I wanted to remind people that this was a man who was very noble, and took his culture and his faith to heart and wanted to share it with the world, and that’s a beautiful thing,” Malek tells me. A few years after his death, Malek, was cleaning out his father’s office and made a huge discovery. From there, Malek, also a filmmaker, began to dig into the story of how The Message came to be. Moustapha Akkad was born in 1930 in Aleppo, Syria, moving to Los Angeles when he was young with the dream of working in film. There, he quickly learned that this was not a world that understood the world he had come from. Moustapha got the idea for The Message in 1968, while he was working in television. “It was really a massive leap to go from television to a massive scale movie with one of the biggest topics he could pick in the world—taking on the story of Islam,” says Malek. The idea evolved greatly from 1968 until it was finally made and then released in 1976. “Amazingly, it started out that it was just going to be a documentary. That was something that I didn’t know, I discovered that working on my documentary about it. That was surprising to me,” says Malek. Many questions arose with the idea of telling the story of Islam. First of all—who should it be for? Should he make a film in English with a Western audience in mind, to teach them about a faith that they are often at best unfamiliar and, at worst, grossly and dangerously misinformed? Or should he make a film in Arabic, giving those of the Muslim faith the ability to see the story they know so well in a new way? Akkad thus set out to do what no one had ever done before—make the same film twice, in two different languages, with two different casts, simultaneously. “He used to say, you have to know your audience and what they want. For this film, the reason he had to do it in two languages was he wanted to do it projected outwardly to the West, and similarly he wanted to have it resonate in the Arab world, so he had to use the original language of the Quran. It was a genius idea to do it in two, but an impossible idea,” says Malek. It proved to be one of the most difficult aspects of production. “It’s three hours in English, and three and a half hours in Arabic, a huge cast, and they had to do every shot twice, and not just shots with actors—even in the shots with the extras. You see some of the shots with five thousand people with camels and horses walking into Mecca. He had to do it time and time again. When you stop, and reset, and tell everyone to go back, that’s an hour each take. Each take, in both films, there are no two takes that are alike. Every single shot in each film is a different shot,” says Malek. While Moustapha had the purest of intentions with his film, many across the world did not understand his vision. Rumors surrounding the film spread, causing some religious scholars to revoke their approval of the film, and Morocco itself, where they had been filming, to kick them out of the country altogether. “There were religious scholars, one of several groups that were doing everything they could to stop the movie. At the time, their influence kicked him out of Morocco,” Malek says. Moustapha Akkad had to send the entire crew home, as well as all the equipment, and try to find a solution. 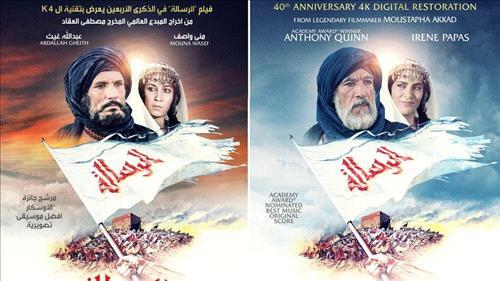 With actors such as Anthony Quinn on hold, Akkad was able to strike up a deal to finish filming in Libya, resuming production after two months. The relocation and the difficulties in doing two films at once ballooned the budget from the initial $7 million to what ended up around $10 million. Through it all, Akkad patiently pushed forward. When it was finally released in 1976, the film was again plagued with controversy. The same influential scholars that tried to shut down production again hurt its release, getting it banned from some theaters, stopping it from being released in many parts of the Middle East, and causing issues in its release in markets where falsehoods spread about the film that led some radical groups to threaten terrorist attacks if it were released. “The release had so much controversy, which hurt its box office chances. In the Arab World, it made nothing. In Europe it did very well, showing in London for three years straight in one theater. In Paris it did very well. Then in the United States, they had opening day in New York City, where it sold out two days straight around the block. It looked like it would be a big hit, but then the controversy happened, and it railroaded it unfortunately. It still did play across the US, but it was not a massive hit,” says Malek. Moustapha, however, never lost faith in his film. “He was supremely confident. There was a quote in the LA Times where he said, ‘Once the film comes out, it’s like a baby, you cannot put it back, and it will impose itself on the world’,” says Malek. Akkad also stayed willing to speak to people that had a problem with the film directly, eager for even one more person to connect with his film. “He mentioned himself, ‘Anybody that has any problem with the film, if you have problem with one scene, I’ll burn it’. People would be so against it but then once they saw it, they would cry, have a very emotional response, and hug him. He had to knock down barriers one by one,” Malek says. The story for most films would end there—but not The Message. Just as Akkad expected, copies started to spread across the world. Bootlegs made their way across the region in the decades following release, and it began to be showed on satellite TV. Soon, it became a cultural touchstone for Muslims everywhere. “It’s been dubbed in over 30 languages, has been seen all over the world, and it’s estimated that it’s been seen by half a billion people all over the Muslim world and Europe and the United States. It’s an amazing success story,” Malek says. “I went with him to a film festival in 1999, and someone told him, ‘This film, because it’s been translated in so many languages all over the world to people who can’t even read the Quran, is second only to the Quran in spreading the positive word for Islam.’ That moment to me blew my mind. I never thought of such a thing. My father was so humble, and it didn’t make his head big. That was one moment where I really felt the significance and the weight of this film,” says Malek. In the past several years, Malek dedicated his time to restoring his father’s masterpiece—in English and in Arabic—and through it all, he felt his father with him. “I got to be so intimate with his work. I was in dark studios for months with these films, doing the color correction, the sound, and I loved every minute of it. I felt I was channeling him in a way. Every choice I made, every decision, I knew he would approve of,” says Malek. The remastered and restored version of the film is now available across platforms in across the world, finally in the way it was intended, with a documentary about the film entitled The Messenger, directed by Malek Akkad, coming in 2019. “I just know he would be so happy to see this all across the Middle East. I know it’s a 40 year old movie and I know a lot of people in the region have seen it, but I’m grateful to everyone that has helped me do this. The challenge is completed. I know my father would be absolutely thrilled. This was something that I needed to get out—a love letter to my father, for lack of a better word,” says Malek. “Is there anything you would like to say to your father now?” I ask.